Mon (紋), also monshō (紋章), mondokoro (紋所), and kamon (家紋), are Japanese emblems used to decorate and identify an individual or family. While mon is an encompassing term that may refer to any such device, kamon and mondokoro refer specifically to emblems used to identify a family. An authoritative mon reference compiles Japan's 241 general categories of mon based on structural resemblance (a single mon may belong to multiple categories), with 5116 distinct individual mon (it is however well acknowledged that there exist lost or obscure mon that are not in this compilation). In heraldry, argent is the tincture of silver, and belongs to the class of light tinctures called "metals". It is very frequently depicted as white and usually considered interchangeable with it. In engravings and line drawings, regions to be tinctured argent are either left blank, or indicated with the abbreviation ar. The name derives from Latin argentum, translated as "silver" or "white metal". The word argent had the same meaning in Old French blazon, whence it passed into the English language. In some historical depictions of coats of arms, a kind of silver leaf was applied to those parts of the device that were argent. Over time, the silver content of these depictions has tarnished and darkened. As a result, it can sometimes be difficult to distinguish regions that were intended as "argent" from those that were "sable". This leaves a false impression that the rule of tincture has been violated in cases where, when applied next to a dark colour, argent now appears to be sable due to tarnish. In heraldry, an attitude is the position in which an animal, bird, fish, human or human-like being is emblazoned as a charge, supporter or crest. Many attitudes apply only to predatory beasts and are exemplified by the beast most frequently found in heraldry—the lion. Some other terms apply only to docile animals, such as the doe (usually blazoned as "hind"). Other attitudes, such as volant, describe the positions of birds, mostly exemplified by the bird most frequently found in heraldry—the eagle. The term naiant (swimming), however, is usually reserved for fish but may also apply to swans, ducks or geese. Birds are often further described by the exact position of their wings. The term segreant is usually applied to the griffin, but this approximation of rampant which is more appropriate for them has also been applied to the dragon. Additionally, there are positions applying to direction, to indicate variations from the presumed position of any charge. Animals and animal-like creatures are presumed to be shown in profile, facing dexter (the viewer's left), and humans and human-like beings are presumed to be shown affronté (facing the viewer), unless otherwise specified in the blazon. Dexter and sinister are terms used in heraldry to refer to specific locations in an escutcheon bearing a coat of arms, and to the other elements of an achievement. "Dexter" (Latin for "right") means to the right from the viewpoint of the bearer of the shield, i.e. the bearer's proper right, to the left from that of the viewer. "Sinister" (Latin for "left") means to the left from the viewpoint of the bearer, the bearer's proper left, to the right from that of the viewer. In heraldry, an escutcheon () is a shield that forms the main or focal element in an achievement of arms. The word is used in two related senses. The griffin, griffon, or gryphon (Greek: γρύφων, grýphōn, or γρύπων, grýpōn, early form γρύψ, grýps; Latin: gryphus) is a legendary creature with the body, tail, and back legs of a lion; the head and wings of an eagle; and sometimes an eagle's talons as its front feet. Because the lion was traditionally considered the king of the beasts and the eagle the king of birds by the Middle Ages the griffin was thought to be an especially powerful and majestic creature. Since classical antiquity, Griffins were known for guarding treasure and priceless possessions.In Greek and Roman texts, griffins and Arimaspians were associated with gold deposits of Central Asia. Indeed, as Pliny the Elder wrote, "griffins were said to lay eggs in burrows on the ground and these nests contained gold nuggets. "In medieval heraldry, the Griffin became a Christian symbol of divine power and a guardian of the divine. azure (blue), sable (black), vert (green) and purpure (purple). In engraving, it is sometimes depicted by hatching of vertical lines. In "trick" or "tricking" (abbreviations written in areas to indicate their tinctures) it is marked with gu..
Mon (紋), also monshō (紋章), mondokoro (紋所), and kamon (家紋), are Japanese emblems used to decorate and identify an individual, a family, or (more recently) an institution or business entity. While mon is an encompassing term that may refer to any such device, kamon and mondokoro refer specifically to emblems used to identify a family. An authoritative mon reference compiles Japan's 241 general categories of mon based on structural resemblance (a single mon may belong to multiple categories), with 5116 distinct individual mon (it is however well acknowledged that there exist lost or obscure mon that are not in this compilation).The devices are similar to the badges and coats of arms in European heraldic tradition, which likewise are used to identify individuals and families. Mon are often referred to as crests in Western literature, another European heraldic device similar to the mon in function. In heraldry, or (; French for "gold") is the tincture of gold and, together with argent (silver), belongs to the class of light tinctures called "metals", or light colours. In engravings and line drawings, it is hatched using a field of evenly spaced dots. It is very frequently depicted as yellow, though gold leaf was used in many illuminated manuscripts and more extravagant rolls of arms. The word "gold" is occasionally used in place of "or" in blazon, sometimes to prevent repetition of the word "or" in a blazon, or because this substitution was in fashion when the blazon was first written down, or when it is preferred by the officer of arms. The use of "gold" for "or" (and "silver" for "argent") was a short-lived fashion amongst certain heraldic writers in the mid-20th century who attempted to "demystify" and popularise the subject of heraldry. "Or" is sometimes spelled with a capital letter (e.g. "Gules, a fess Or") so as not to confuse it with the conjunction "or". However, this incorrect heraldic usage is not met with in standard reference works such as Bernard Burke's General Armory, 1884 and Debrett's Peerage. Fox-Davies advocated leaving all tinctures uncapitalized. A correctly stated blazon should eliminate any possible confusion between the tincture or and the conjunction "or", certainly for the reader with a basic competence in heraldry. The figures used as supporters may be based on real or imaginary animals, human figures, and in rare cases plants or other inanimate objects, such as the pillars of Hercules of the coat of arms of Spain. Often, as in other elements of heraldry, these can have local significance, such as the fisherman and the tin miner granted to Cornwall County Council, or a historical link; such as the lion of England and unicorn of Scotland in the two variations of the Coat of Arms of the United Kingdom. 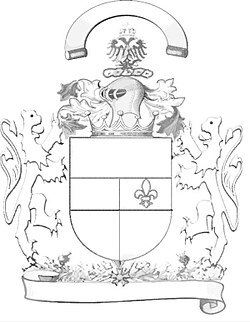 The arms of nutritionist John Boyd-Orr use two 'garbs' (wheat sheaves) as supporters; the arms of USS Donald Cook, missiles; the arms of the state of Rio Grande do Norte in Brazil, trees. Letters of the alphabet are used as supporters in the arms of Valencia, Spain. Human supporters can also be allegorical figures, or, more rarely, specifically named individuals.There is usually one supporter on each side of the shield, though there are some examples of single supporters placed behind the shield, such as the imperial eagle of the coat of arms of the Holy Roman Empire. The arms of the Congo provide an extremely unusual example of two supporters issuing from behind the shield. While such single supporters are generally eagles with one or two heads, there are other examples, including the cathedra in the case of some Canadian cathedrals. At the other extreme and even rarer, the Scottish chief Dundas of that Ilk had three supporters: two conventional red lions and the whole supported by a salamander. The coat of arms of Iceland even has four supporters.The context of the application of supporters may vary, although entitlement may be considered conditioned by grant of a type of augmentation of honour by admission in orders of chivalry or by heraldic authorities, such as in the case of traditional British heraldry.